Winding down or speeding up? 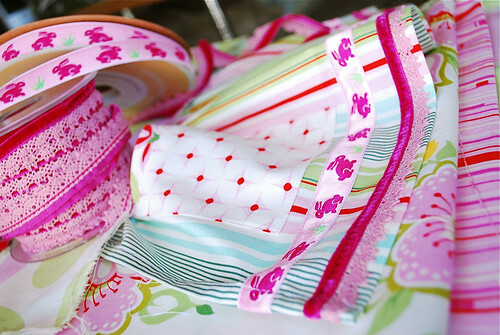 - Stop staring and start sewing! Winding down or speeding up? We're getting close to the end of the school year here (it's at the end of May) and these next two months are already filling up with all those things we try to fit in before it's over (parent-teacher conference, field day, tests, etc.). It seems we finally get to take a breath after the holidays and then we're right smack dab into it again. 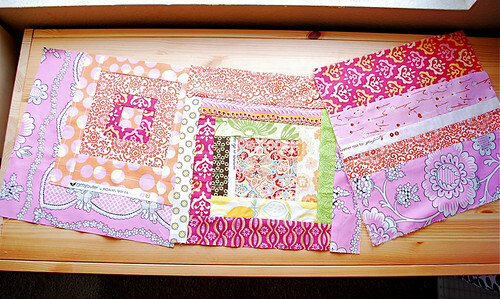 We're starting the wind down on our virtual quilting bee too. I still have one more block to finish and since I got my fabric out last I can just relax and wait now (no pressure to the gals in our group who haven't done their's yet, seriously. I'm swamped with life too.). Here are the 3 I've received so far...the first one is from Melissa and I love the zesty Amy Butler print in it (it's fun to get a fabric I don't have in my stash). The middle is from Jessica and I really love the brown Summer in the City fabric because that collection seemed to come and go so fast (and it was amazing!) so it's nice to have a piece of it to remember. And I simply adore the Heather Ross fabric Kristena used. I didn't get any of that collection and it put a big smile on my face when I opened the package. These make me happy. One of my store goals for last year was to start carrying Renaissance Ribbons. They are so beautiful and definitely qualify as "gourmet ribbon". Well, I didn't quite get it done last year but when the rep called last month and said she'd be in town I figured it was the perfect time. These are my favorites (and wouldn't you know, the most expensive). 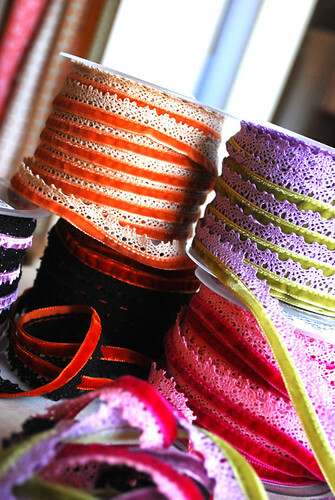 They are from France and are velvet and lace, and the colors are lush. Sigh. I played with them today! I'm making one of my Evelyn Apron Skirts using Heather's Nicey Jane fabric and I'm having lots of fun with it all. I've been ironing the heck out of the ribbons just to see how they handled it and they are great. The lace on the velvet ribbon started to melt a little after I held my iron there (on the highest heat) for quite awhile (way longer than necessary). And neither of them shrank at all. Nice! I hope everyone is having a great weekend! We are enjoying the orange blossoms here in Arizona. They smell heavenly but the allergies are a pain (sinus headaches, ugh). The sudafed helps but if anyone has any better ideas that won't make me totally groggy, let me know!